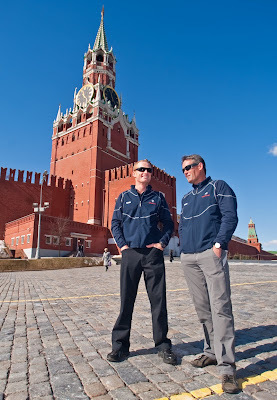 Team CEO Russell Coutts and skipper James Spithill were in Moscow last night as guests of BMW Russia. From the story on the team website: The best yachtsmen of the Russian Federation attended the event, as well as representatives of the business-elite, famous actors, producers, designers and chief editors of leading Russian titles. The famous Russian sports television personality Kirill Kiknadse presented the gala night. 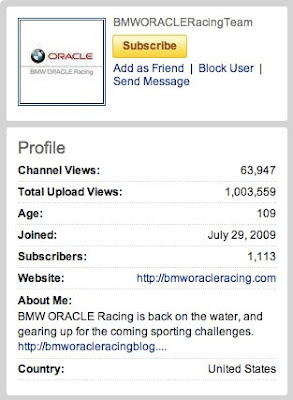 "We congratulate the entire BMW ORACLE Racing team," said Ian Robertson, BMW AG member of the board for sales and marketing. "Finally we have managed to achieve the result we have been working on for over two and a half years. 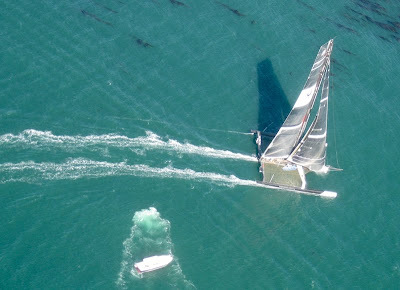 BMW Company is a qualified developer of yachting solutions, and the America’s Cup winner applied many of our unique technologies. For instance, BMW engineers managed to develop new constructions notable for their light weight. BMW can justifiably be called the premium brand in yachting." Congrats go out to John von Seeburg and his video team, second to none, as their YouTube page counter clicks over the one-million views mark. They say your first million is the hardest; let's see how they do on the second! And here, one of those videos of which John von is particularly proud, and for good reason. Enjoy the 'Aerial Symphony', the most viewed clip on the channel. 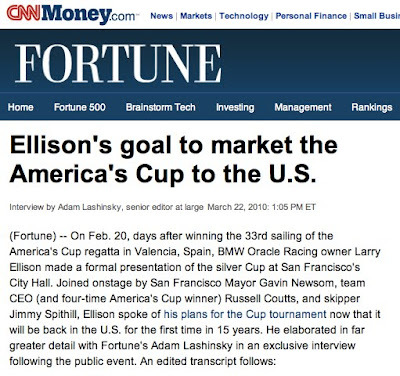 Larry Ellison spoke with CNNMoney/Fortune in San Francisco last month, in a piece published on the web today. In the story, he speaks about the BMW ORACLE Racing team and outlines some of his vision for the future of the Cup. On a day of congratulations, we send another one out to Emirates Team New Zealand for winning the Louis Vuitton Trophy in Auckland. 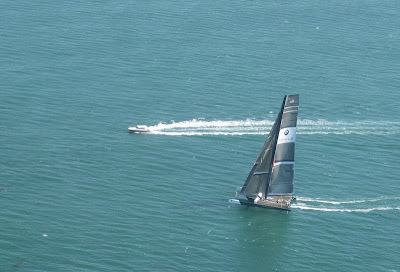 The final was between the Kiwi team and Mascalzone Latino Audi Team - the challenger of record for the 34th America's Cup. 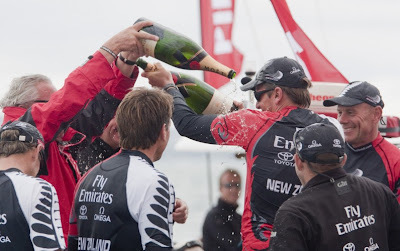 In the event, Emirates Team New Zealand was too strong for the Italian squad and they swept the final, 2-0. The LVT series is moving from strength to strength and this regatta in New Zealand was a testament to the strength of the teams involved, who put on a great display of AC style racing. There was some fantastic competition, plenty of lead changes, a few close encounters leading to penalties, and some days in big breeze to please the photographers as well. We can't wait for the next event, in May in La Maddalena, Sardinia, where the BMW ORACLE Racing will return to action. And congratulations as well to the WSTA and Louis Vuitton for putting together a great regatta. See you in Sardinia. 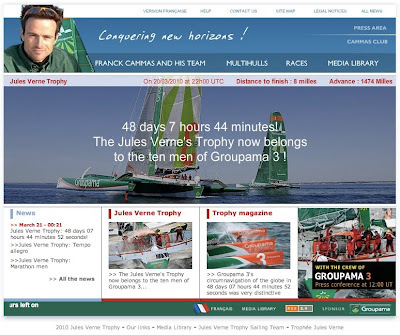 Our good friends on the Groupama sailing team, led by skipper Franck Cammas have just broken the Jules Verne Trophy record, setting a new benchmark of 44 days, 7 hours, 44 minutes and 52 seconds! Congratulations to Franck and his team, who were vital in jumpstarting the BOR multihull programme. Well done guys! 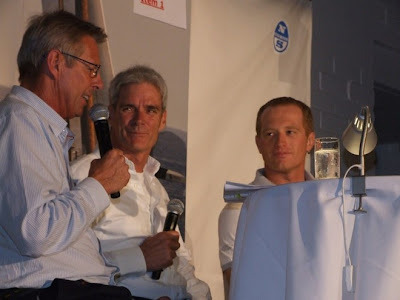 Over on Sail-World.com, there's a nice piece about an evening at the Royal Prince Alfred Yacht Club in Sydney with two of the Australian legends from this America's Cup - BMW ORACLE Racing skipper James Spithill and Alinghi design guru Grant Simmer. The focus of the story is about how 'stoked' both men were about the opportunity to push the design envelope in this last AC. It's a nice read; be sure to take a look. Jimmy Spithill had a few moments with one of his heroes, John Bertrand - skipper of the first challenger to win the Cup - this morning in Auckland. Bertrand was in town to take in the final few days of the Louis Vuitton Trophy, and both men met the media this morning. Spithill spoke about that moment in 1983 when Bertrand steered Australia II to that historic victory - or at least as much of it as he can remember as he was just three years old! “It was such a key moment for Australia, probably our proudest sporting moment in the history of Australian sport. It was such a legendary story, it was every kid’s dream. We looked up to John and the guys on the boat. Where I was brought up, I lived near the Beashels, and Rob Brown was round the same little bay where I grew up. If it hadn’t been done, I probably would have still ended up in sailing, but probably without the hunger I had after that win,” Spithill says. 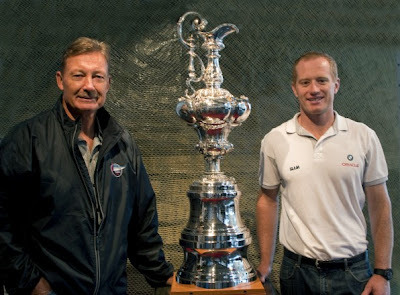 As for Bertrand, he first spent some time with Jimmy during the 1999-2000 Louis Vuitton Cup, when Spithill became the youngest man to skipper a team racing to become the Cup challenger. “I gave a little talk to the team, and I remember James with all these questions, and how enthusiastic all these young men from Downunder were,” Bertrand said. “It’s fantastic. He’s a great ambassador for Australia, the way he has conducted himself all through his career. 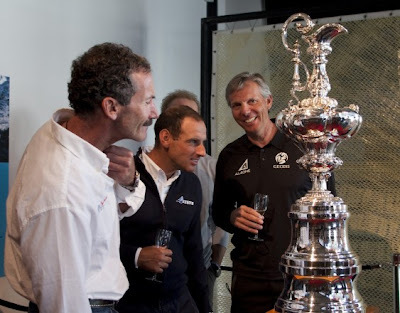 “I must say I was very proud to see James doing his thing (in the 33rd America’s Cup) having known James over the years, and doing it in such style. 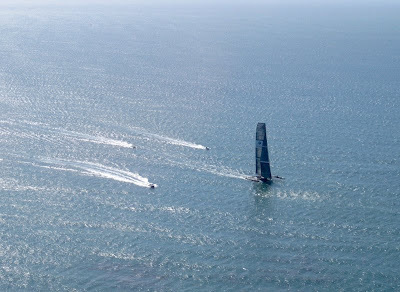 It was an incredible technology battle; another era of the America’s Cup no question about it. From a purist point of view it was fascinating, from a Joe Public point of view it was intriguing." This comes to us this morning - with appreciation - from Tom Ehman in Auckland. Two of only four skippers to win the America's Cup as challengers since AC1 in 1870 were together this morning for a media breakfast. They are the "wingmen" -- John Bertrand had the winged-keel in 1983, and Jimmy had the wing-sail in 2010. Interesting, too, that both are Aussies. Peter Rusch will have more on all that posted nearby soon. I just wanted to note with appreciation the work Peter (CAN, BOR PR team) has done here in AKL during the LVT. Peter, pictured below early this morning recorder in hand, has been doing double duty here -- working for LV in the media center while still finding time to blog for BOR and help Jane and I with our team-related duties. Thanks, Peter! 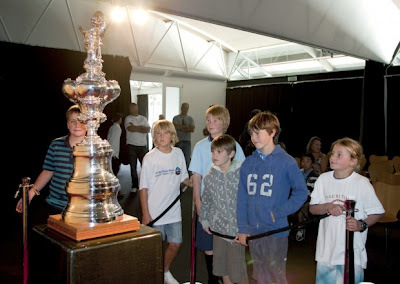 Team skipper Jimmy Spithill, along with other team members who are in Auckland this week, met with the next generation of potential Cup sailors on Thursday afternoon, when the team held a Q+A and poster signing session for the kids who have been sailing in the Louis Vuitton Junior Trophy regatta. Two groups of 20 kids have been racing a qualifying series that will see the top ten from each group compete on Saturday for a chance to be 18th man during the final of the Louis Vuitton Trophy. At the session, they had the opportunity to meet the team members and learn from Jimmy what it was like to sail on the USA. And they could see the AC trophy, up close, and personal. Suzanne McFadden, writing for the LVT website spoke with Jimmy as the session started. See here for more. The America's Cup is proving to be a big hit at the Louis Vuitton Trophy. This evening, following the first elimination round of racing, Louis Vuitton impresario Bruno Troublé invited the LVT skippers to pose with the Cup, along with BMW ORACLE Racing skipper Jimmy Spithill. 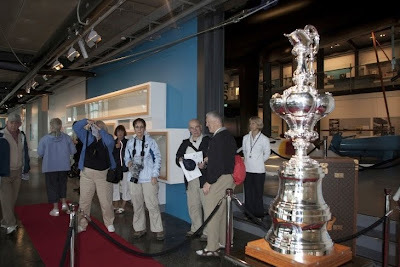 Richard Gladwell of Sail-World.com is promoting an evening with Jimmy Spithill to take place here in Auckland where the America's Cup trophy is on display at Voyager, New Zealand's Maritime Museum in the Viaduct. If you're in town, be sure to drop by. The America's Cup is in NZ. It's a sort of homecoming for the Cup, which was won by Team New Zealand, with Russell Coutts at the helm in 1995. That year, he beat the defender, the San Diego Yacht Club. 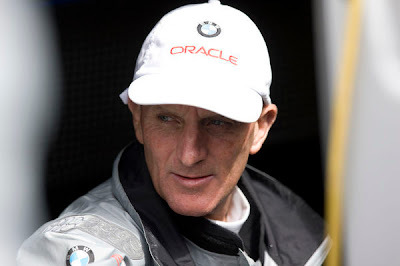 15 years later, as CEO of BMW ORACLE Racing, Coutts won the Cup back for the United States, and San Francisco's Golden Gate Yacht Club. Here, some photos (courtesy Bob Grieser/Louis Vuitton Trophy) from early Tuesday morning in NZ as the Cup takes up residence for a short stay in Auckland. The trophy will be on display for the public at Voyager, the New Zealand Maritime Museum, down at the Viaduct Basin, through Thursday afternoon. 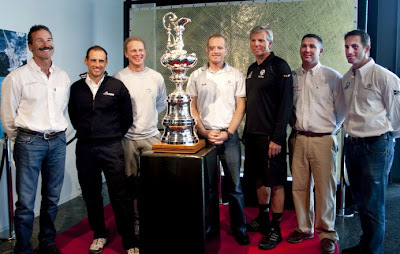 The America's Cup trophy is on its way to New Zealand. 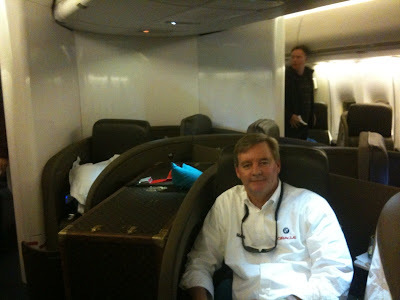 Here she is, tucked away in her Louis Vuitton travelling case, buckled in to her seat on Air New Zealand flight 5 with Tom Ehman (USA) her travelling companion for this trip. While many of the BMW ORACLE Racing team have dispersed to all corners of the globe to get some rest and spend time with family, a handful are racing again in Auckland at the Louis Vuitton Trophy regatta. And today, congratulations go out to Brian 'Puck' MacInnes (CAN) and his ALEPH teammates, including trimmer Thierry Fouchier (FRA). On Monday morning, the ALEPH team, struggling at the bottom of the Louis Vuitton Trophy leaderboard, shocked the previously undefeated Emirates Team New Zealand squad, earning a big win on a breezy morning in Auckland. "Finally, we had a couple of breaks go our way," Puck said. "We had the start we wanted, took an early lead, and sailed well the rest of the way." 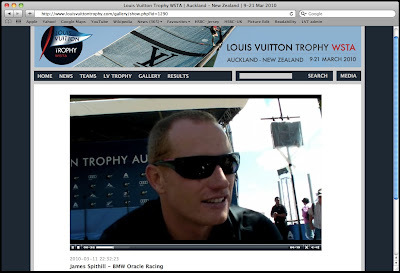 Skipper Jimmy Spithill turned up in Auckland earlier this week to take in the sights and sounds at the Louis Vuitton Trophy. A founding member of the WSTA, the association of teams that is organising the Louis Vuitton Trophy events, BMW ORACLE Racing wasn't able to compete in Auckland so soon after the America's Cup. But the team will be racing in the next event, in La Maddalena, Italy in May. Spithill met with a lot of friends here, who are competing on other teams, and watched some of the racing. He says he was impressed by the level. "I'm a little concerned. The level that's out here now - any one of these teams can win races - and you see that in the results… We've done very little racing. For me personally, and JK (tactician John Kostecki), we've been so focussed on the multihull, that we've done nothing (to prepare for this kind of racing). So I'm a bit concerned and I can't wait to get into it." See more from James in Auckland here. The Port of San Francisco has resolved to do 'everything possible' to host the 34th America's Cup. "...The Port Commission on Tuesday afternoon were scheduled to approve a resolution in support of efforts to bring the next race to the Bay. "'Holding the America’s Cup Race on the San Francisco Bay will bring significant major sporting event income into the local economy from teams’ operating expenditures, and increased private and corporate tourism to watch races on the same order of magnitude as the Olympic Games, Super Bowl or World Cup,' stated the resolution." 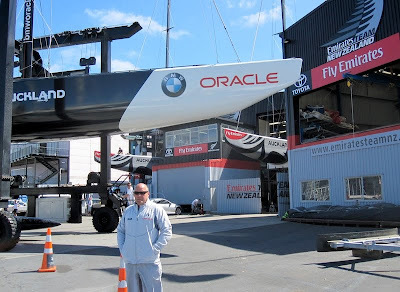 Ian 'Fresh' Burns - team design coordinator - speaks about the 33rd America's Cup, and how Oracle technology helped the team bring the Cup back to the United States in this podcast. 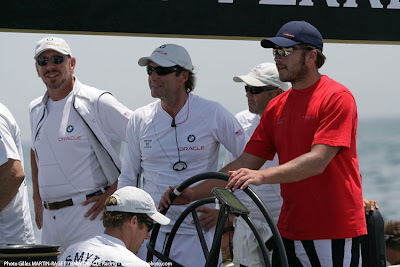 Before he was an Olympic Gold Medallist, Bode Miller (USA) sailed with the BMW ORACLE Racing team as 18th man during the 32nd America's Cup. The image above is from Louis Vuitton Act 12, in 2006. With Bode contributing to a medal haul that allowed the United States to lead the total medal standing at the Winter Olympics in Vancouver, and Larry Ellison and team bringing the America's Cup back to the US, February was a great month for American sport. A fan of the team, Mark Thomas, writes in from California and sends some photos, pre-wing sail, too. A flight paramedic on Mercy Air, out of Carlsbad, Mark says he happened to have a camera with him one day when they were flying over USA which was out on a training sail. "The photo's were taken out of 'Mercy Air 5' while returning back from a trauma flight," Mark writes. "I just happened to have my camera with me this day and saw the large mast off shore. I was the only one that day on the helicopter that sails, but the whole flight crew was taken away by the size and speed of the trimaran. Congratulations on your win from the Mercy Air 5 flight team." Thanks for the wishes Mark, and for the photos. Much of the America's Cup community is descending on New Zealand over the coming days ahead of the Louis Vuitton Trophy Auckland regatta, which begins next week. Although BMW ORACLE Racing isn't fielding a team here, it is a founding member of the WSTA and remains a strong supporter of the Louis Vuitton Trophy. BMW ORACLE is planning a return to action in May in the next regatta in Sardinia. The Auckland event was simply too close to the America's Cup Match for the team to be prepared to race competitively here. But several team members are in town, including Grant 'Guthrie' Davidson. More are expected over the next week or so. "We've committed to providing one of our ACC boats (USA 87) to the regatta as a backup," Guthrie said by way of explaining his presence in Auckland. "The event will primarily be raced on the two Emirates Team New Zealand boats and we'll provide our boat as backup in case of any problems. "Our two ACC boats will also be used in the La Maddalena event in Italy and onwards in the other stops on the Louis Vuitton Trophy circuit, so we're getting both boats readied and then we'll ship them back to Europe after this regatta. USA 98 is now being prepared to be put on it's keel and then they'll both go on a ship at the end of March." In addition to overseeing the boats here, Guthrie is catching up on some family time, following the final frenetic push in Valencia. "It's nice to be home reconnecting with the family, sitting by the pool, playing a bit of tennis! It's a beautiful place to be at this time of year." Sailing team coach Glenn Ashby enjoys some well deserved press in his hometown newspaper, the Bendigo Advertiser. An excerpt: ALTHOUGH Australia has not won the America’s Cup since 1983, Australian sailors have helped international syndicates win one of the world’s greatest contests. 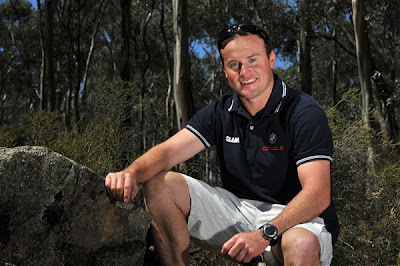 Among those Australians is Glenn Ashby, a Bendigo boy at heart, who has now conquered sailing’s greatest challenge. Ashby, who first began his sailing career at Bendigo Yacht Club, can now add winning the America’s Cup, with the US-based crew on BMW Oracle to his list of achievements. 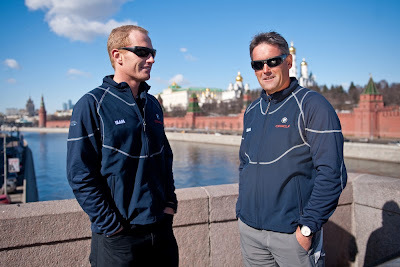 The 2008 Olympic Tornado multi-hull class silver medallist was employed as the head coach of the Oracle sailing team, after Oracle’s James Spithill suggested he take up the position with the American team. Our friends at BMW are as happy as we are with the result of AC33. Here's a short highlights video they've produced for their YouTube channel.